Earth’s atmosphere scatters sunlight in every direction. Bluish colors are scattered stronger than reddish tones. As a result, the sky is glowing in bright blue during the day. The phenomenon is called the Rayleigh scattering. Sometimes the Moon is visible during the day. The bright part of the Moon is bright because it is lit by the sunlight. On the other hand, its dark part does not receive sunlight, and thus barely emit any light. Because of these reasons, the dark part of the Moon is dominated by the blue color of the sky. 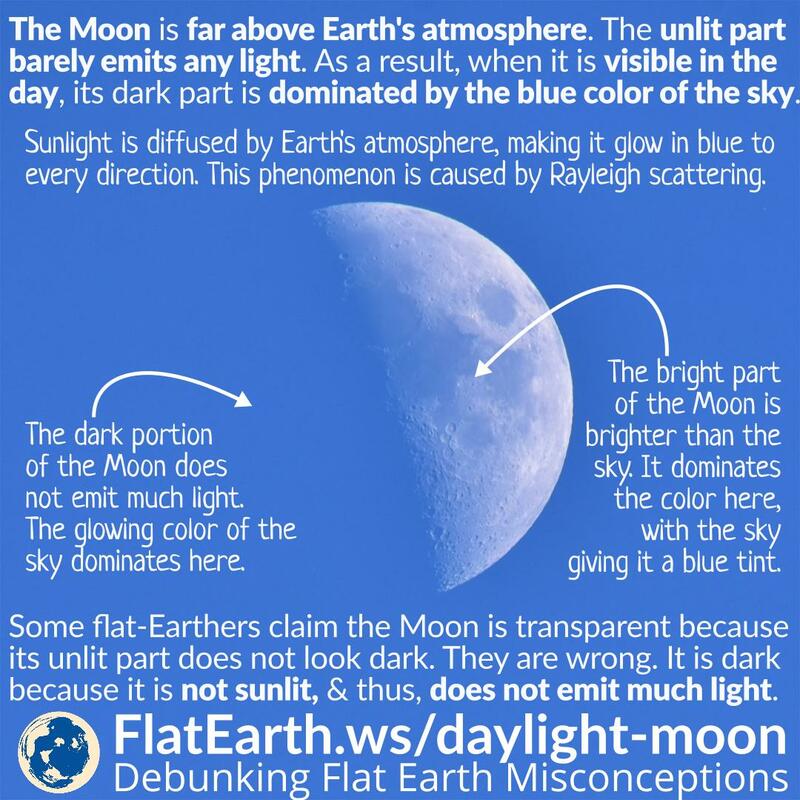 Some flat-Earthers insist that the Moon is transparent because the dark part of the Moon is not visible during the day. They are wrong. They are confused by their own assumption: that the Moon is closer than the ‘sky’. They invented this ‘explanation’ to explain away the glaring problem in their theories. And just like all the glaring holes it is trying to cover, it is also wrong. Their second misunderstanding is that they appear to think dark colors are the result of ‘dark light transmission’. They are wrong. An object appears dark because it transmits less light, not because it transmits ‘dark light’.